button on the Data Compare window. 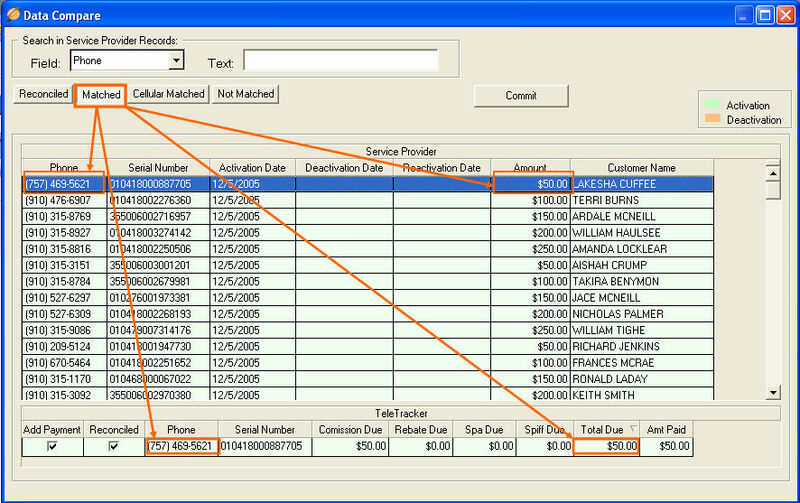 This button shows complete matches between TeleTracker Online and the Service Provider commission worksheet. A complete matches constitutes both the phone numbers and commission amounts matching together. Depending on how the Service Provider commission sheet was formatted, matching phone number entries may be listed more than once in the Service Provider and TeleTracker window panes. By default, all activations showing within the Matched button will have Add Payment and Reconciled with a checkmark. Due to the fact that the phone numbers and commissions amount match each other, the Activation(s) will be ready to Auto-Reconcile. If desired, Add Payment and/or Reconciled may be unchecked. Add Payment : Place a check in this box to add the full payment due from the Service Provider. Reconciled : Place a check in this box to mark the Activation as reconciled. Clicking the Commit button will only effect the Activations shown on the current active button. In this case, only Activations on the Matched button with a Reconcile checkmark will move to the Reconciled button.